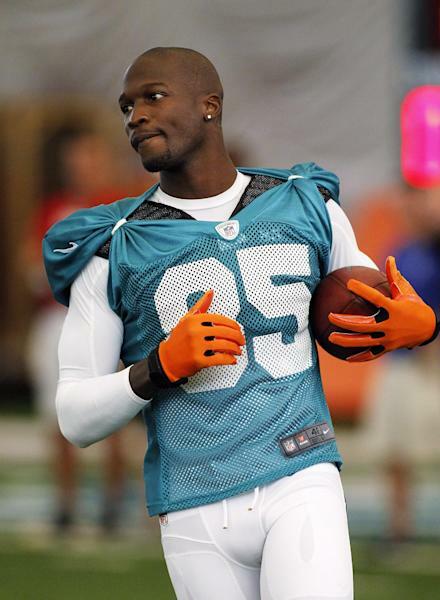 DAVIE, Fla. (AP) — Dolphins receiver Chad Johnson was arrested Saturday on a domestic violence charge, accused of head-butting his newlywed wife during an argument in front of their home outside Miami. Johnson and his wife, Evelyn Lozada, were at dinner and she confronted him about a receipt she had found for a box of condoms, said Davie police Capt. Dale Engle. The argument got heated and continued on the drive home, he said. When they arrived in their driveway in Davie, the 34-year-old Johnson head-butted Lozada, she told police. Lozada, who is on the reality show, "Basketball Wives," was treated at a hospital for a cut to her forehead, Engle said. Johnson, who changed his last name back to Johnson from Ochocinco after his July 4 wedding to Lozada, was being held Saturday night in Broward County Jail where he will remain until he can appear before a judge, which Engle says might not be until Monday. He is charged with simple battery, domestic violence, which is a misdemeanor. Team officials were "aware of the situation and are in the process of gathering of relevant information," Dolphins spokesman Harvey Greene said. Johnson's agent, Drew Rosenhaus, declined to comment. On Friday night in the Dolphins' 20-7 loss to Tampa Bay in the exhibition opener, Johnson let the only pass thrown to him slip through his hands. He was known as Ochocinco for the past four seasons. The name was a playful reference to the No. 85 he wore on his jersey. Johnson and Lozada were prominent in the recent first episode of HBO's "Hard Knocks: Training Camp with the Miami Dolphins." VH1's "Basketball Wives" is filmed in Miami and also features Shaunie O'Neal, the former wife of former NBA star Shaquille O'Neal. Lozada used to be the fiancee of NBA player Antoine Walker.